Google includes mobile identity factors in its newly released algorithm. If your website is recognized as built within a mobile-friendly responsive design, you can rank higher in mobile search results. What Is A Responsive-Design Website? A Responsive Design Website automatically adjusts its viewing experience to any mobile device. As more and more searches originate from mobile devices, your website can maintain its readability and remain easier to navigate through a responsive design. Google indexes your website on a regular basis, and will include you in their mobile results whenever they find that you’ve made the move to a mobile-responsive design. As a business, the sooner you move to a mobile-ready design, the sooner you’ll increase your chances of appearing more prominently in mobile search results. You won’t be left out by turning off half the Internet! into an environment that is compatible for viewing on today’s mobile devices. As the number of people who own smartphones and tablets continue to grow, so will mobile Internet traffic. Mobile traffic is expected to increase more than ten-fold by 2017. This inevitable increase in mobile activity translates to an increased need for WordPress users to ensure their site is easy to view on all devices — desktops, tablets, and smartphones. With a WordPress Mobile Design, you can become mobile-ready without the need to build multiple websites — Simply by redesigning your existing website within a Mobile-Responsive WordPress Theme. The latest WordPress Mobile Design Themes are now built around ‘Responsive Design” and capable of adjusting their layout to all mobile devices! Recent studies find that only around 10% of small to midsized businesses (SMBs) in the U.S. have upgraded their website to become mobile-optimized, and are ready for the coming wave of mobile devices. On the flip-side of this coin, 90% of SMBs, by not accomodating the growing trend of smartphones and tablets, are missing out on a growing opportunity to grow their businesses. This year, more than half of all searches will be made from a mobile device. And mobile users are quickly growing more comfortable with shopping on their mobile devices. Mobile online transactions are expected to skyrocket to $90 billion in 2014 — a six-fold increase over last year. Don’t be left out by turning off half the Internet! 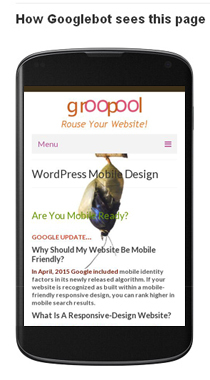 Contact Groopool and find out what we can do for your website with a WordPress Mobile Design!